These look like zucchini muffins, but a bit greener. Monstrous green muffins! For the adventurous souls. Here’s the kale. I used Tuscan kale, though any type of kale would be fine, even spinach. You want it very finely chopped in the same way as when you finely chop herbs. If you use a food processor, don’t process it too much that it becomes a puree. Pulse it. You don’t want to liquefy the kale at all. To make the pistachio meal a very fine consistency, I blend it with the brown rice flour called for in this recipe. This makes a superfine flour mix for a nice and soft cake texture in the finished muffin. I also tested out some toppings: banana chips, homemade kale chips, pistachios, and pineapple chips. For my first attempt, I used too much kale and the muffins were too green. The best topping were the chopped pistachios. Because this muffin is nice and moist, the other toppings lost their crunch later on. Plus, pistachios looked the best. Second attempt with less kale. Looks more like zucchini bread batter. This was much better and not too green. I used 1 teaspoon of matcha in this batch, which gives a more assertive green color. I think it would work best with just 1/2 a teaspoon. The good thing about gluten-free baking is that you can mix or add a little of something to the batter after it is already mixed because you don’t have to worry about overworking and toughening the batter. 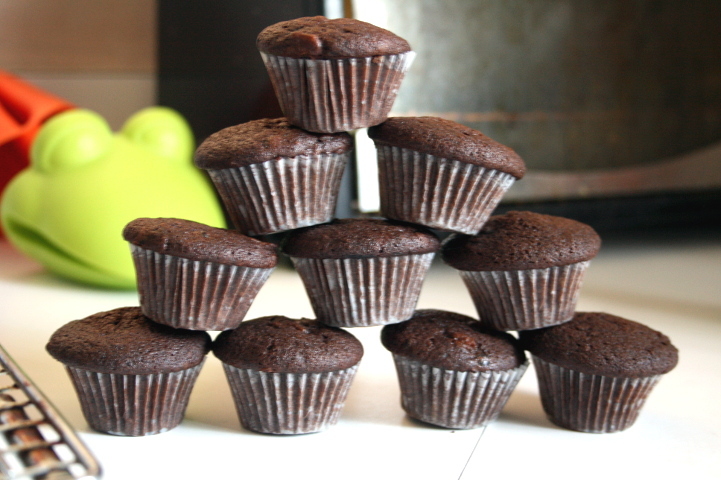 Also, if you don’t want a green muffin, you could make a chocolate variation and add cocoa powder. I would start with a tablespoon, mix the batter, and adjust to taste. These gluten-free muffins are pretty tasty and they have a nice level of moisture. I guess they fall under the “quirky” category like this cookie recipe that I previously posted. Using a spice grinder or food processor, pulse 1/2 cup of chopped raw pistachios with 3/4 cup of brown rice flour to make a superfine pistachio-brown rice flour blend. You may have to do this in batches. Dry ingredients: In a large bowl, whisk together the brown rice-pistachio mix, millet flour, salt, baking soda, baking powder, cinnamon, ginger, and nutmeg. Wet ingredients: In another bowl, whisk eggs for 3-4 minutes until light and fluffy. Then whisk in the brown sugar, cane sugar, coconut oil, vanilla, and lemon zest until thoroughly combined, whisking for about 2 minutes. Fold in the mashed banana and apples auce. While mixing, slowly add half of the dry ingredients to the wet ingredients. Mix until well combined. Add the remaining flour mixture and stir until blended together. Fold in the kale and crushed pineapple until combined. Spoon the batter into the paper-lined muffin cups, filling about 3/4 full. Sprinkle with the chopped pistachios and bake for about 20-25 minutes or until a toothpick inserted into the muffin comes out clean and crumb-free. Cool on a wire rack. Serve and enjoy! Variation: you can add 1 cup of blueberries (use the smaller wild blueberries if you can find them as they are ideal for baking) and bake an extra 5 minutes. I love pistachio ice cream and this milk reminded me of it. It didn’t need too much added sweetness. I just used a shake of stevia for each serving. What’s fun about making your own nut milk is that it doesn’t take too much time and you could customize it with flavorings of your choice. No need for a nut milk bag either, just use a very fine mesh strainer with the finest holes you can find. Then use the remaining pulp (dry it in the oven on lowest setting for a couple of hours, stirring often) for the muffin recipe! Soak pistachios overnight (optional step). Rinse. Using a blender on high speed, blend the pistachios and 2 cups of water. Strain the liquid through a very fine mesh sieve. Place the remaining pulp back into the blender and add the remaining 1 cup of water. Blend on high speed. Strain the milk one last time and add any flavorings or sweetener to taste. Okay, these muffins are not camera shy. This entry was posted in Baking, Beverage, Breakfast, Food, Gluten-Free, Recipes, Snacks and tagged fruit muffin, gluten-free baking, gluten-free muffin, Green Smoothie, kale, matcha, Muffin, nut milk, Pistachio, Pistachio milk, Tuscan Kale. Bookmark the permalink. G’day! GREAT photos and they look healthy indeed! Love this idea looks soo hearty and filling! I would love to try this! Thank you 🙂 Looking forward to reading more of your blog. Pingback: Cheat Day: M&M cookies! | the misadventures of a cooking monster.. om nom! Awesome! 😀 I’m always inspired by your posts! Well, I thought I’d “waddle” over to your place and check the kitchen! Man, now I’ll have another 10 pounds to lose! Great looking stuff, as always…You’re site is so delicious! Thanks Skip 🙂 While cooking all these recipes, I have to keep up with the exercise LOL. I like pistachios but I’m not sure about the pistachio milk. On muffins they have got to be good. Looks so healthy but so tasty on the other hand! Thank you 🙂 It was satisfying and not too sweet. Thank you 😀 Your pinterest page has some good stuff! They’re beautiful, Samantha. I’m still tasting the pistachio milk. Yum! Wow! Creative and healthy! Beautiful pictures, too!